There is nothing wrong with your audio signal. Please do not attempt to adjust your on-line frequency. Italian Fuzzrockers E.X.P. will control the audio. They will also control the audio. For the next twenty-nine minutes, this smashing outfit of psychedelic/bluesy hipsters will control all that you think and hear. Chemical assistants welcome, but not required. You're in the hands of experts, so to speak. And they'll take your eyeballs for a polychromatic spin: two enclosed posters depict luscious death-metal maidens, a battalion of anacondas, and plenty of good 'ole fashioned fire, amongst other goodies. 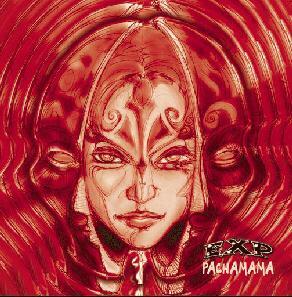 A musical force since '97, going strong in 2002, Pachamama breaks no new musical ground, but serves up a heaping, helping, hell, kickass serving of heavy, pungent rhythms spanning the last thirty years. Disappointment is not an option. For more information you can visit the E.X.P. web site at: http://www.expsupafuzz.com.